Figure 1 – Location of Zama oil discovery. 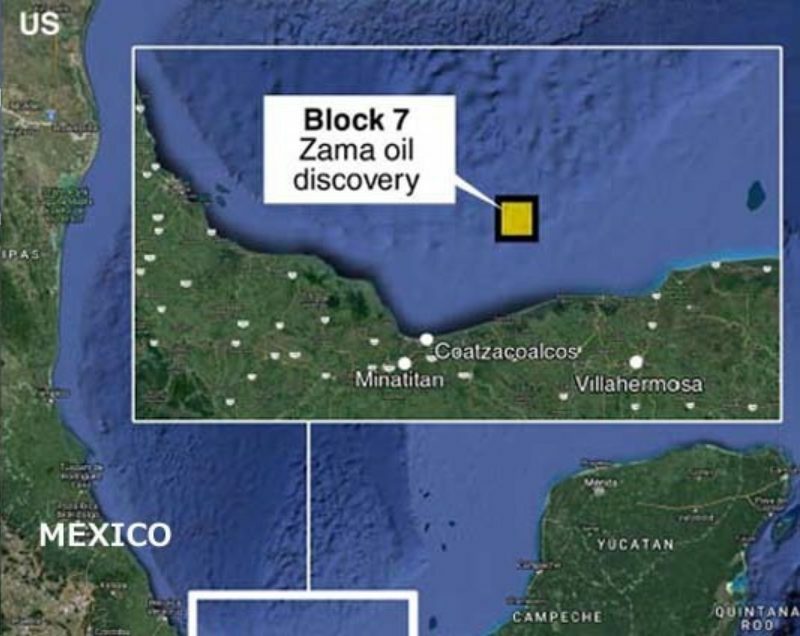 Talos Energy and its partners, Premier Oil and Sierra Oil and Gas, have announced a world-class oil discovery at its Zama prospect, in Block 7, offshore Mexico (see Figure 1). The Zama-1 well is the first offshore exploration well drilled by the private sector in Mexico’s history – a great start for exploration investors in Mexico. 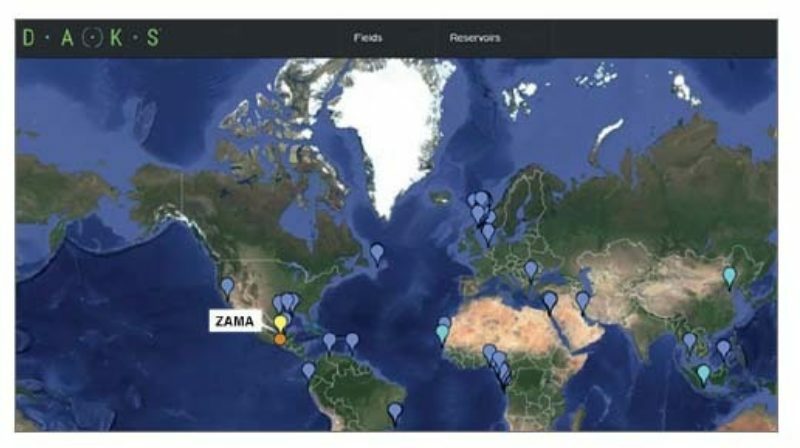 The C&C Reservoirs global knowledge base DAKS has been employed to review the Zama discovery and benchmark the recovery factor and development practices that could enhance the recoverable oil. We used the DAKS proprietary workflow of Capture > Search > Analyze > Insight to provide this brief review. By the 17th of July 2017 the following (see Figure 2) has been released on the Zama -1 well: Figure 2 presents an implied recoverable volume of 350 – 800 MMBBL. Does this capture the full range and is there further potential upside? Analogs can help to answer this question. Using the DAKS classification system, we quickly located all global fields with similar lithology, fluid and engineering parameters. These will be the population of applicable global reservoir analogs that can be used for benchmarking and further insight. The population of applicable global reservoir analogs can be further refined based on the challenge that is being addressed. Proximal analogs rarely provide sufficient information hence a global view is needed. For example, Zama is located in the Salinas Basin (see Figure 3) where the existing discoveries are dominated by the Cantarell complex. These are fractured breccias and as such are not applicable analogs for Zama. Figure 3 – Map of applicable global reservoir analogs. The Zama discovery is in shallow water depths and an initial recovery factor of 40% has been suggested. In these shallow water depths and deploying latest technology, is a higher economic recovery factor possible? The recovery factor histogram (see Figure 4) from the applicable global reservoir analogs shows that the average re-covery factor achieved is 38%, but the upper range exceeds 60%. More detail on the recovery factor by development scenarios employed and the incremental recovery achieved through the application of improved recovery or enhanced oil recovery techniques can be learned from these analogs. Figure 4 – Recovery Factor Histogram. We note that the Miocene sandstone play type seen in the Zama oil discovery has numerous global analogs. These show the recovery factor may exceed the originally estimated 40%. For those fields that have exceeded 40%, their reservoir management best practices indicate continuous water injection and horizontal wells have had the greatest impact. Also, a number of the analog reservoirs require sand control or stimulation due to clay plugging. With further geological detail from Zama-1 (such as porosity, permeability, clay mineral component and diagenetic history) these features could be further evaluated using analogs (see Figure 5). Figure 5 – Characterization table for improved recovery parameters.